Sometimes, it is so easy to just go with the standard choices when it comes to a quick lunch. Yes, that includes fast food joints, salad bars and of course, food courts. However, there are plenty of places to grab a quick and fairly inexpensive meal. One just has to look "beyond what they can see" (Lion King reference...). 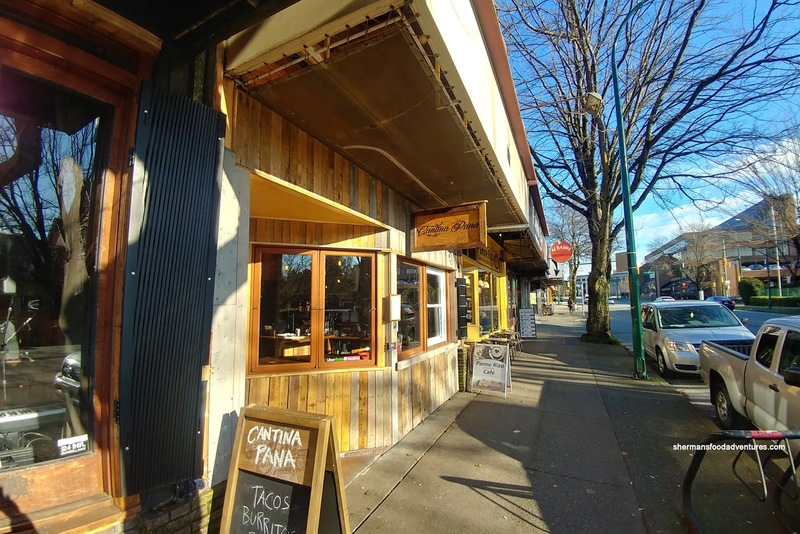 That brought Viv and I to Cantina Pana located on the strip of restaurants and businesses along Cornwall between Chestnut and Maple. 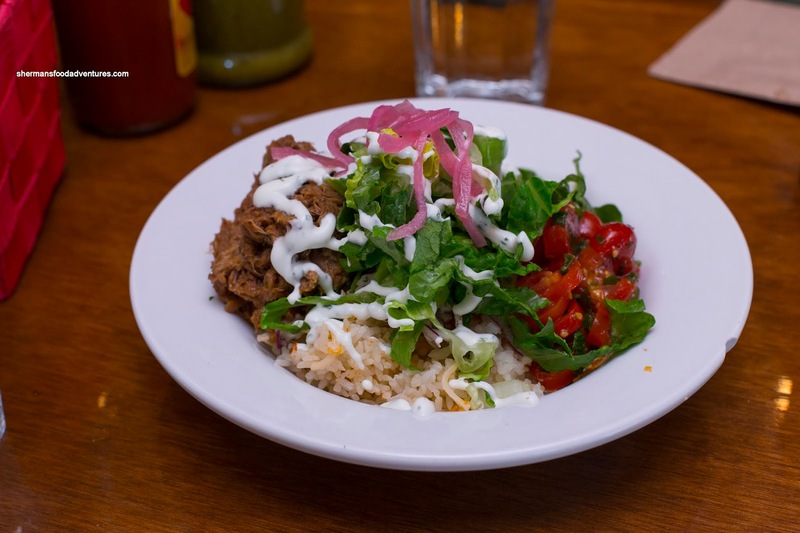 This small lil' joint serves up tacos and bowls for the price you would pay eating at Subway. Before we got to the aforementioned items, we just had to try their Chili Cheese Pana Tots. 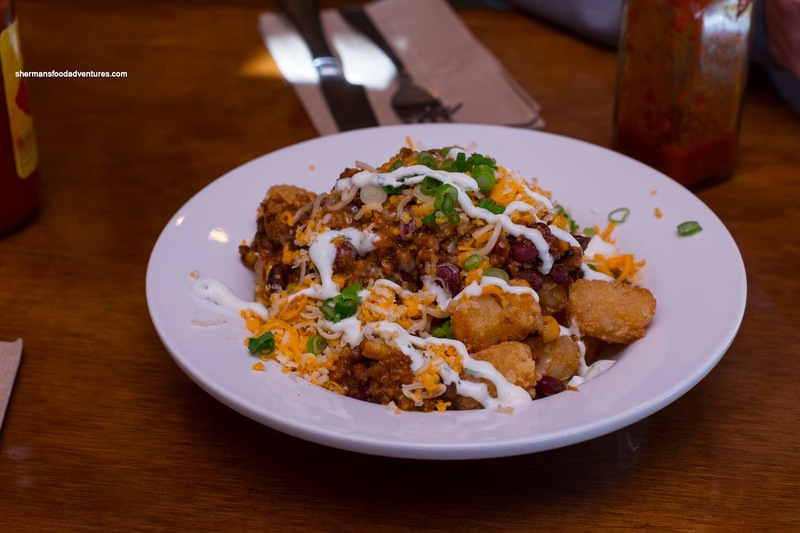 If you haven't noticed these days, tater tots are a thing. Hey, we weren't complaining with these ones since they were fried up golden brown and crunchy. What made it special was the ample topping of spiced beef chili, Monterey jack cheese and green onions. Yes, they ate like a meal with the robust meatiness and rich cheese. For $11.00, the Barbacoa Beef Brisket Bowl was pretty substantial on a bed of Mexican rice topped with cheese, lettuce, tomato, tarragon cabbage slaw, salsa, pickled onion and lime creme fraiche. The large serving of beef was tender with a meaty chew. Combined with the rest of the ingredients, especially the tangy tomatoes, there was a good mix of flavours. It felt sort of "healthyish". Off to the tacos, we had the Orange Chili Pork and Crispy Coconut Cauliflower on the first plate. We found the pork to be tender and of course on the sweeter side. There was some spice too from the braise as well as the chipotle salsa. To cool it down, there was some creamy guacamole while the diced white onions and corn added crunch. The lime on the side helped add the necessary acidity as well. Interestingly, the only veggie option we chose was actually one of my favourites. I found the cauliflower to be the right texture in between firm and soft while the crunch of the deep fried was uniform. Underneath, there was a substantial amount of guacamole, crunchy and creamy tarragon cabbage slaw and tangy honey-dijon dressing. 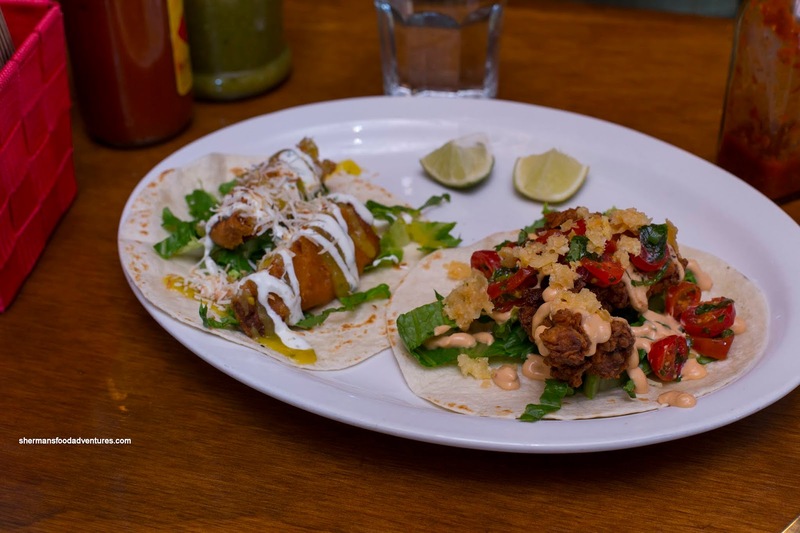 The key here was the wealth of flavours that made this meatless taco interesting. 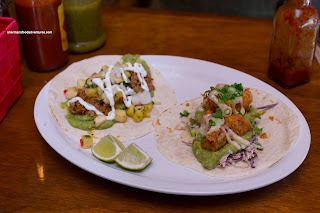 For our other 2 tacos, we had the Crispy Fried Cod and the Buttermilk Fried Chicken. Both featured large pieces of protein and could easily be enough for person with smaller appetite. If one ate both, it would be enough for lunch. I found the cod to be moist and flaky with a crunchy tempura coating. It was dressed in mango-mint mojo and lime crema while accompanied by romaine lettuce and toasted coconut. This was light-tasting and certainly aromatic to a point, but the flavours could've been more impactful. Mind you, a few drops of hot sauce solved that problem. As for the chicken, it was super crunchy with moist juicy meat on the inside. The grape tomato salad was the key here as it added moisture and a burst of sweet tang that made the taco. A spicy Caesar dressing added creaminess and some heat, lots of flavours going on. 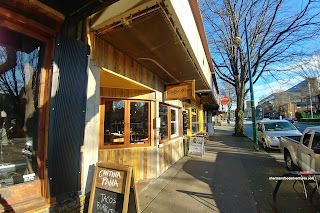 Overall, we enjoyed the eats at Cantina Pana where the portions were large and the prices were fair.